Happy October! Fall is my favorite season. As a homebody at heart, I love the cooler weather, otherwise known as The Baking Season. I was looking for a good pumpkin bread recipe, but none of them seemed quite right. For starters, most recipes had 3 cups of white sugar, and that crossed some sort of self-imposed line of Too Sweet/Too Unhealthy. I may not always be Mrs. Healthy Eating, but I do have my low standards. I decided that 1 1/2 cups of sugar and half a cup of maple syrup should yield the appropriate level of sweetness yet allow me to feel somewhat virtuous. Like Buddy the Elf, I try to stick maple syrup in everything I can think of. The result was pleasantly sweet but not cakelike sweet. Certain members of this family (hint: not the children) thought it could use just a tad more sugar, so next time I will plan to add 1/2 cup of brown sugar and see how that flies. To give proper credit, this was the recipe I originally looked at and built upon, although you will see that the additions and omissions are too numerous to mention, and it barely resembles the original (which, by the way, if you do use, be sure to increase the cooking time based on the numerous comments that 30 – 40 minutes wasn’t nearly long enough). Eat a loaf and freeze a loaf! One thing my mother taught me was to always have something sweet to serve to unexpected company with coffee. Drop by unexpectedly and you might just score a slice. Preheat oven to 350 degrees. Butter and flour two 9 x 5 loaf pans. Stir together sugar(s), maple syrup and oil. Stir in eggs, vanilla and pumpkin. Combine dry ingredients in separate bowl. Blend dry ingredients into wet mixture, alternating. Divide batter between two loaf pans. Bake for 50 minutes or until cake tester comes out clean. Let stand 10 minutes. Remove from pans and cool. 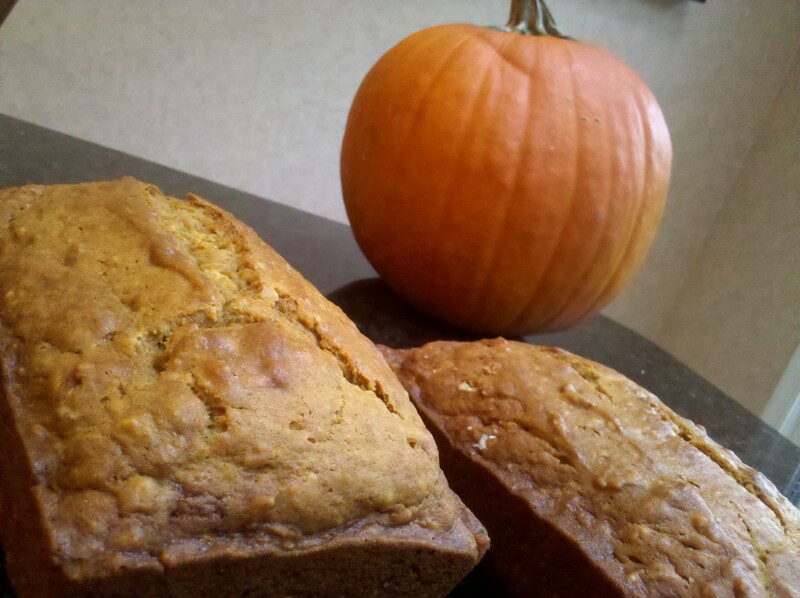 This entry was posted in Desserts and tagged maple pumpkin bread by Mom Mom's Apron. Bookmark the permalink. My grandmother always had pumpkin bread…one in the freezer for emergencies and always brought pumpkin bread as a gift for the hostess. I can’t eat it without it bringing back dozens of fond Granny memories. I wonder how it will taste with GF flours. That’s sweet, Claire. Let me know if you ever try any of my recipes GF and I’ll edit them to add GF notes if they’re any good. Yum! Pumpkin bread is one of the few things I can reliably get both my children to eat. Though they would tell you that I mess up its sweet goodness by subbing applesauce for some of the oil and adding ground flax seed.